Josh loves quesadillas. I know he likes the taste, but he also likes saying the word. One of his favorite movies is Napoleon Dynamite and he loves quoting the quesadilla line. If you have seen the movie, you know what I am talking about. The other night he requested quesadillas for dinner, I decided to mix things up and make pear, brie, and honey quesadillas. This recipe was inspired by our grilled pear, brie, and honey crostini , that was featured in Salt Lake Magazine. It is one of our favorite appetizers. The flavors are so good together. I had a feeling the same ingredients would taste amazing in a quesadilla, and I was right. The melted buttery brie is topped with pear and red onion slices, a drizzle of honey, and a sprinkle of fresh rosemary. Everything is sandwiched between two flour tortillas. I cut the quesadilla into wedges and the brie and honey oozed out of the side. We got a little sticky, but it was worth it. 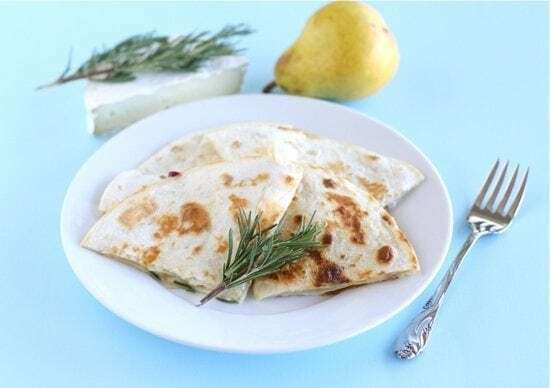 Pear, brie, and honey quesadillas make a great appetizer or light meal. They are a little more sophisticated than the typical quesadilla, but still extremely simple to make. We have some exciting new to share! It’s been a busy week for Two Peas and Their Pod. We were featured on Saveur and CNN’s Eatocracy this week. We are are still pinching ourselves. We are extremely grateful and humbled to be in the spotlight. Thank you for all of your support. We have the best readers and appreciate your continued support with our food blog. 1. Heat a 10-inch nonstick saute pan over medium-high heat. Place 1 tortilla in the dry pan. Evenly arrange the brie slices over the flour tortilla. 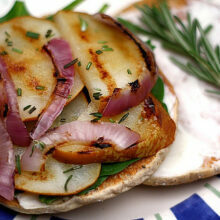 Next, add the pear and red onion slices. Drizzle with honey and sprinkle with fresh rosemary. Place the other tortilla on top. Heat for about 3 minutes and then flip. Heat for another three minutes or until the cheese is melted. 2. Remove from pan and cut into wedges. Serve warm. I love fruit and cheese quesadillas! Seriously they are a staple in this house! WOW…you had me at brie! this sounds amazing…and interestingly enough i’ve never actually done a fruit and cheese quesadilla! This reminds me of your crostini recipe! I love the combo of fruit, brie and honey! this is a fabulous idea! My husband also loves quesadillas but I have a feeling it would take a little convincing to get him to eat this! 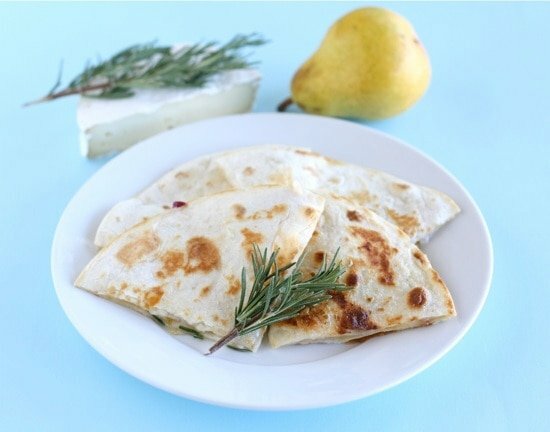 I love brie, pears, and honey but I’d never thought of putting them in a quesadilla! Congratulations Maria! Like I said, I will just be grateful to have known you one of these days when you are totally famous! Brie cheese goes so well if fruit, especially pear! We love quesadillas in my house and these look delicious. So yummy! Congrats on everything this week Maria! Well deserved! in the “80’s” I used to frequent this very hip, trendy place called TRUMPS on Melrose. They had a quesadilla with this flavor profile. You’ve brought back memories, sista! Looks yummy and may just have to be my lunch today! I love pears & brie in any form! Looks delicious!! Oh yum. 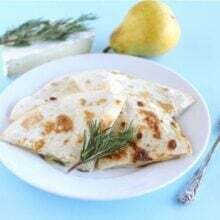 Brie is one of my favorites and this quesadilla sounds amazing. I’m adding this to my recipe box. I like to do my quesidillas on two tortillas. I lay out all the ingredients on them open and then when the cheese melts I fold them over. I just like the “closed” sides. Now that’s a flippin’ quesadiller! Yum, yum, yum! That flavor combo sounds awesome!! So excited for you both…congrats on your success!! Congrats Maria! If anyone deserves the press, it’s you guys! I love the idea of mixing fruit into savory creations and this sounds out of this world good. I’m also a brie fanatic. So…yeah. These sound totally amazing! 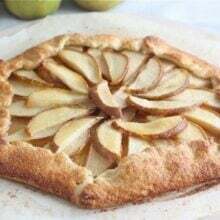 I love brie with apple butter, so I’m sure I would love this! These flavors sound amazing together! Fruit and cheese quesadillas are the best. You really chose a winning combination here. And congrats on the spotlights – you guys deserve it! I love pears, I love honey, and I love brie. I usually eat them on a baguette, but a quesadilla sounds devine! Oh my goodness, does this sound amazing! 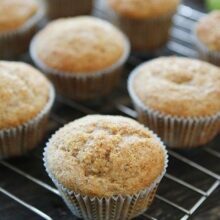 I’m going apple picking in a couple weeks so I am bookmarking this recipe! Funny thing, I’ve been thinking about brie cheese all day long. This is a lovely combo. Quesadillas are just so quick and make such an easy lunch or dinner. I love experimenting with different fillings. This combination looks delicious! this is one of our favorite pizza combos, yum! I used to eat honey and tortillas ALL the time…now I know how to turn them into a meal! What a lovely combo of ingredients. I can’t wait to try this as it looks quick and something I can fit in to my meal plan when there is little time to cook. Thanks for sharing this with us. After seeing this quesadilla yesterday, I immediately had a craving for one. I didn’t have the ingredients to make this delicious looking quesadilla but I made use out of the ingredients I had on hand. Yum! I can’t wait to try this flavor combo! This looks like a wonderful light meal idea, and such an interesting combination of flavors. Thank you for sharing this, and huge congratulations on being featured on Saveur and CNN! I make a lot of quesadillas for my kids but they are always just with cheddar cheese or beans and cheese. I would love this for dinner for myself! Pear and brie is such a wonderful pairing… and what an interesting idea for an appetizer! Those look like dang good quesadillas! If I had brie in my kitchen I would be making this for lunch right now. Wow, you had me at brie! What a different flavor combo for a quesadilla but it looks wonderful. Congrats on the features! I’m on a total honey kick lately. Sounds wonderful! This is pretty much my dream quesadilla! And I LOVE Napoleon Dynamite and the quesadillas. Haha TINA!!! dessert, dinner, breakfast, snack–this could be any or all of those! delightful. These sounds yum! I wanted to let you know that I featured you guys on me and my sister’s blog on Friday Favorites. I hope you don’t mind. Have a great weekend and keep up the GREAT work. Thanks Erica for featuring us! So nice of you! My hubby loves the quesadilla line too! These look scrumptuous. This looks delicious! Yum! Love the ingredients! So, so yummy! Congrats on the good “ink” !!! Congrats on the features! I’ve never had the fruit and cheese quesadillas and I’ve never made it all the way through Napoleon Dynamite, maybe I’ve been living under a rock! Must try this soon! Congratulations! That looks like one mighty sweet and sophisticated quesadilla. What a great flavour combination for quesadilllas! I just stumbled upon your blog, and this quesadilla looks amazing! Pears and brie both being high on my favorite ingredients list, these cannot be anything but good. Adding rosemary into the mix is a really good idea! Fantastic mixture of flavors, Maria! The rosemary is a really nice touch. I love a sweet take on a savory dish. Pears and honey and brie… you can’t go wrong with this combo. Can’t wait to try. I could totally eat cheese and bread in any form, especially quesadillas. They’re so easy to make and they really fill me up. Your recipe looks delicious. I usually make these Quick Chicken Quesadillas. I love them! This has been on my “to-make” list and I finally made it last night. That…was…AWESOME! The combination of flavors was unique and fantastic. I even loved that I was able to get all the ingredients from my local food co-op. Knowing it was made from local/organic ingredients made it even that much better. Kudos! Kristen-don’t you love these flavors together? Glad the quesadilla was a hit! i think i just died and went to grown-up quesadilla heaven…i have NEVER tried this combo but it sounds divine! We just LOVED these! we love brie on anything. Thanks for posting this!! These quesadillas look like a fancy version of the usual, and great flavor combo! We absolutely love sweet, fresh pears, fragrant rosemary and the melty, creamy goodness that is brie. Would never have thought of this combination but can’t wait to try!